What is your favorite Tsukihime route? View Poll Results: What is your favorite Tsukihime route? Thread: What is your favorite Tsukihime route? Tsukihime - What was your favourite route? Just finished all 5 routes and I gotta say, wow. Which was your favorite route? Do you have a favorite Bad End? Last edited by hociyid; August 1st, 2018 at 11:56 AM. My favorite heroine is Ciel so her route is a personal favorite. Arc's route is pretty well condensed in the manga. You probably understand the differences between the Near and Far Side routes. I think one of my personal favorite bad ends was that really edgy one where Shiki goes crazy after killing Ciel in one of the Far Side routes and goes "Welcome to my killing chamber"
I had some blog posts about my reactions to playing and watching Tsukihime but that was a long time ago. My fav is Arcueid. Original Saber face is the best. 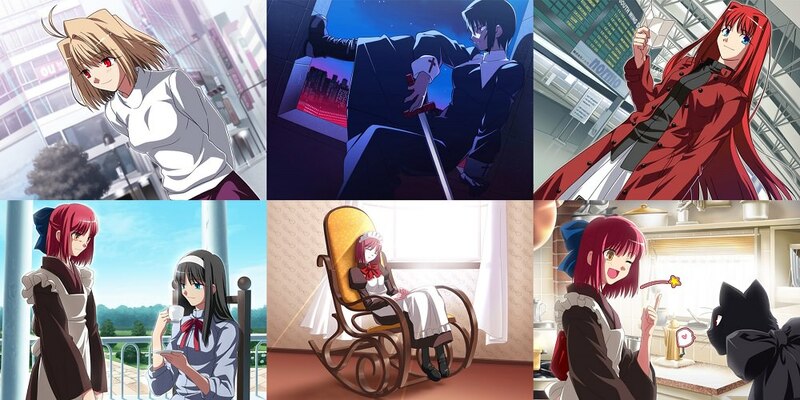 All have their own ups and downs and unique strengths, but I liked Ciel and Akiha's the most -- if only because I liked the Ciel route's take on the hotel's hallway scene better, and because Akiha is Bestest Girl among the Best Girls of Tsukihime. Well, it wouldn't be Ciel or Hisui. Ciel's route has the issue of not being substantially different from Arcueid's route until quite late and loses a lot of impact as a result. And I don't really like Ciel that much either. Hisui has the same problem of not being very interesting plus I don't actually remember anything except Shiki going insane, the twin switch, the fight in the hallway and then the two endings. 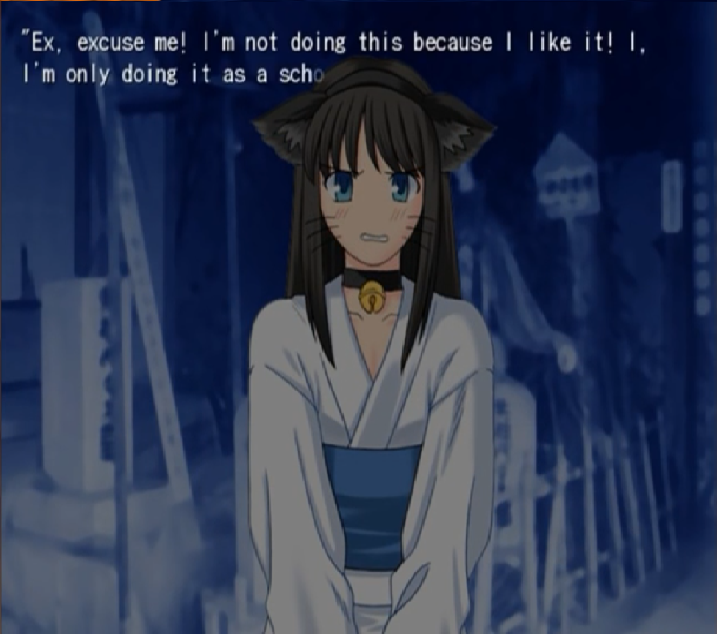 Akiha's route was pretty good but she loses some points just cause I like the other two more. Then between Arc and Kohaku... Toss up, I guess. I don't think either one has the strongest writing but they had the most impact for me. I hope one day we do get the remake to refresh my memory because I just can't really stand the shoestring budget anymore. I mean I'd have thought not liking Ciel that much would be a plus for her Route, since it's mostly just Arc's Route but better done (they really need to change it up if they actually do the remake. 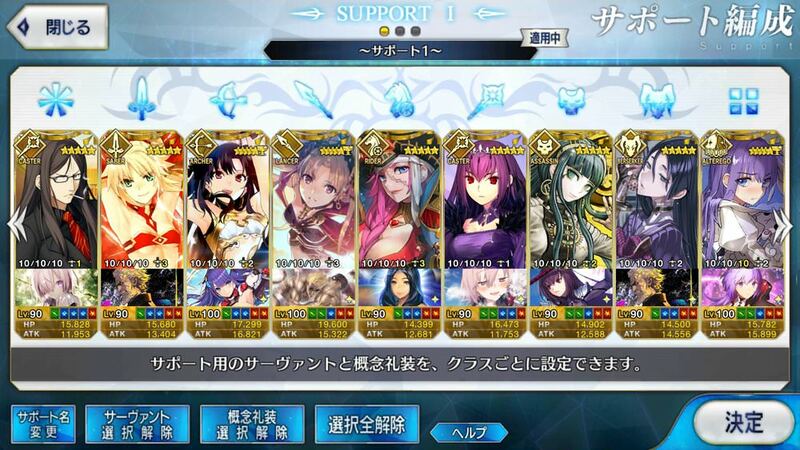 Also, get rid of NTArc plz Nasu). The same problem can be said of the Far side Routes- there's a lot of overlap between scenes and events there that make it kinda 'ugh, this again' especially if you do what I did and play through Routes Back-to-back. Within Far Side I think it's kinda hard to say. Hisui's, as Arha said, has that terrible period of Shiki being drugged and insane hiding in his room that's super boring, but I also love Hisui's True end to bits. Kohaku was good but kinda marred for me because I half wanted to Slap her for being all 'let's destroy the life of the Girl who went out of her way to help me'. And Akiha's was so sad, much feelz. So I guess I'm not sure I have a Favourite Route. They all have lots of the same weaknesses/flaws (you can really see the difference in Nasu's writing since then). Overall though Far Side>Ciel Route>Arc Route>Unreleased Sacchin Route>Rotten Garbage>Ciel "Good"/NTArc ending. Drunk Anime Is The True Path. 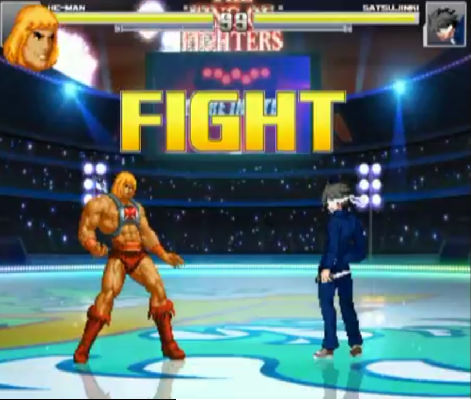 Melty Blood since that's where all the best characters are. Otherwise, I like Arc best so hers. But the one I'm most eager to read is Ciel's. Likes attention, shiny objects, and... a ball of yarn? That makes me think of Rin as a loan shark. Admittedly, she'd probably be the hottest loan shark you'll ever meet. She'd probably make you smile as she sucked you dry. Oh dear, that doesn't sound like yuri at all. I have a imouto fetish, so the route I was the most eager to read back when I started the VN was Akiha's... but that ending was just too sadWHY IS SHE THE ONLY ONE WHO DOESN'T HAVE A GOOD ENDING, DAMMIT! SHE DESERVES A GOOD ENDING!. Kohaku route was the most 'shocking' of then all and I particulary like Kohaku, but... I don't know... Maybe it was too short, as that route was basically to grip loose ends. If it had the same things as Hisui's route, it probably would be my favorite. And basically every route made me love every heroine. Before reading her route I really didn't like Arcueid and did not especially like Ciel, but their routes made me like both. A hard decision between either Ciel or Arc but seems that Arc wins it on me by a small margin. Can I just say how distracting you avatar is. Seriously, I cannot, NOT, look at the ears. Do you have a favorite Bad End? Where Shiki kills Akiha in an incredibly badass way and it just ends on a shot of the moon. Ciel's. It's Arc's route but better. Akiha's would be my second choice. I think they'll pull a FSN and actually lock the routes so you go through them in the supposed order. When I first played Tsuki I actually skipped Arc's route cuz I had just read the manga. I eventually got back to complete it so I could get to read the Eclipse epilogue. My favorite is Arc. It's simple, it's delivered well, and I'm a total sucker for bittersweet endings like Arc True. It also has my favorite versions of Arc and Ciel as characters. It's also the route that works best in standalone form. Ciel route is so frustrating. In terms of plot, I think it has the highest potential because of how the roles of the characters are subverted, but I find the execution so clumsy, the emotional climaxes fall flat. 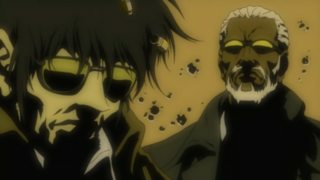 I feel the characters of Shiki and Ciel are mishandled. Akiha route is really slow and I'm not a fan of the various endings. It also has my least favorite SHIKI in it. Hisui route is overall very weird. The story is slow and confusing, the final confrontation is an anticlimax, and the high point is definitely the True ending (which to me is probably the best scene in the game). Also, the killing chamber bad end is pretty badass. Kohaku route is my second favorite. Apparently it was binge written by Nasu as a really late addition. It's very linear and very simple, but it has a bunch of stuff that props it up: the friendly neighborhood killer scenes, Akiha as a villain, relatively tasteful/cute/emotive romance and a really badass final battle. The ending is a bit too convenient, but I personally like that they decided to wrap things up with a happy end. I also like the characterization, with my favorite versions of Akiha, Shiki, SHIKI and Kohaku. Ultimately, what keeps it from being my favorite is the fact that it doesn't stand on its own - it depends on Hisui route. Last edited by aldeayeah; August 9th, 2018 at 06:09 AM. It's not for nothing that Arc's route was the one chosen for a manga and anime adaptation. And while I hated the ending of Arc True the first time I read it, its emotional impact does stay with you. I kind of wish that the manga hadn't altered it, actually. Happy that I randomly decided to look at this forum right when this thread got made, also Akiha only having a single vote is a crime.